Applying water directly to the soil surface is the most resource-efficient way to irrigate your plants. Some crops, such as tomatoes, can be more prone to disease if their leaves are constantly getting wet, so drip irrigation can also help reduce disease issues. Consistent watering also helps reduce the chances that your fruiting crops will develop blossom end rot. 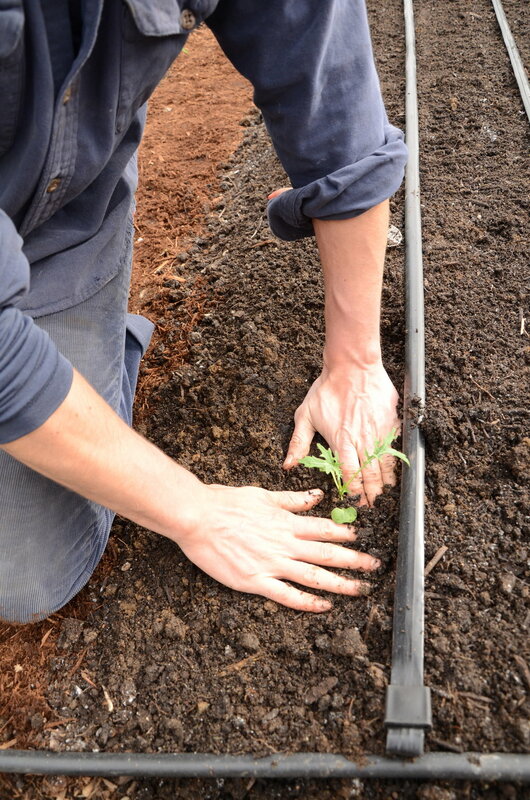 Drip irrigation helps organize things because you can seed and transplant right along the drip lines, ensuring consistent germination and that water is going right to the roots of the emerging plants. Conventional wisdom is to water crops deeply every few days to promote the growth of large root systems, encouraging the plants to chase the water deep into the subsoil. Experiment with different watering schedules to find what works best for your climate, soil type, and crop selection. The “golden range” of moisture to aim for is comparable to the feel of a damp sponge after you’ve wrung it out. A weekly moisture check and 30 seconds updating your timer settings will ensure proper watering all season long. 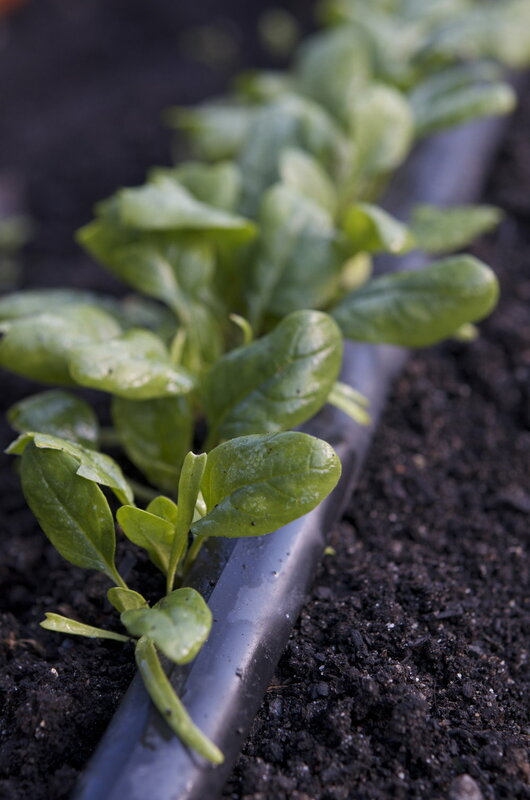 Drip irrigation lines are not under pressure between watering cycles, so the tubing and drip lines tend to empty themselves of water after each session, which means you can leave your system in place during the winter. You should remove the Y-valve, timer, pressure regulator, and filter and store them inside until setting your system back up in the spring. 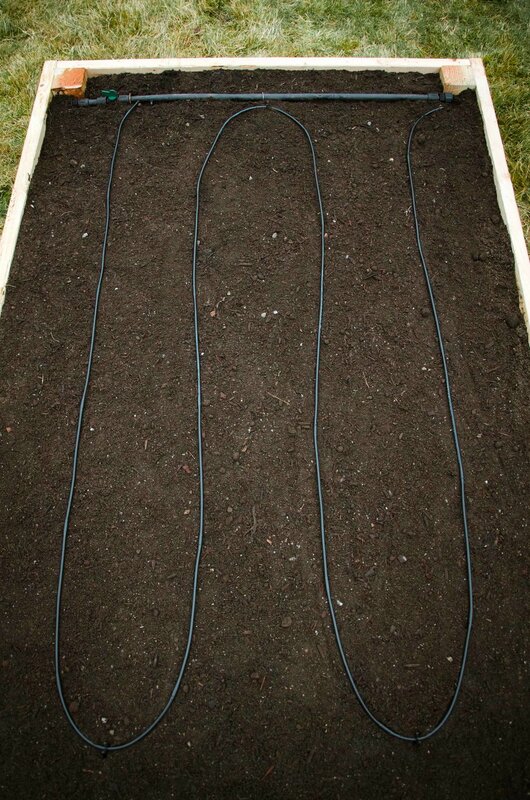 Both the 1/4 inch drip line and the drip irrigation kit come with tubing with pre inserted drip emitters. This is a really important detail to look for, as the bubblers and systems that require you to insert your own emitters are much less effective and not nearly as fun to work with. The drip tape is what we use in our gardens, but there are no kits set up for drip tape, so you'll have to out everything together yourself. A guide to piecing together a drip tape irrigation system in is our book, Food Grown Right, In Your Backyard.